Tapenade Bistro is a Mediterranean restaurant in the heart of Steveston. 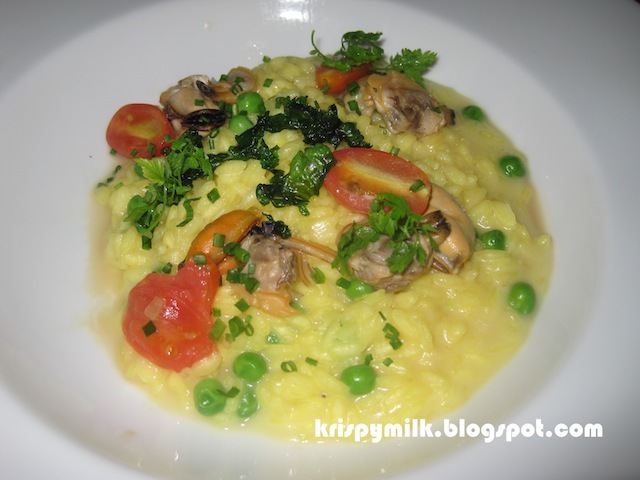 It calls itself a fine dining restaurant, and I agree in terms of food quality and presentation (as well as prices). The ambiance is average and the decor doesn't exactly scream sophistication. I was there on a Sunday night with my family and the noise level was much higher than I would expect at a fine dining restaurant. We were given bread to start. It was nice since it was served slightly warm. 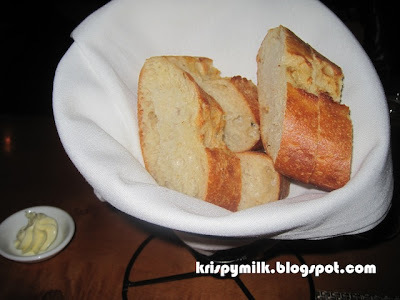 After we were done with our bread, someone (not our waitress) came by and asked if we wanted a refill. We said yes, and she took the bread basket back to the kitchen. She returned shortly and promptly gave our bread to the table next to us. I could only assume she had forgotten in those 30 seconds that the bread basket was ours. In the end, I asked our waitress to get us more bread. Both waitresses were friendly and I could tell they were trying hard, but I don't think they were used to serving so many tables as the place was quite packed. The food took a long time to come, so luckily we had some bread to chew on. I got the soup of the day ($8) which was butternut squash soup. 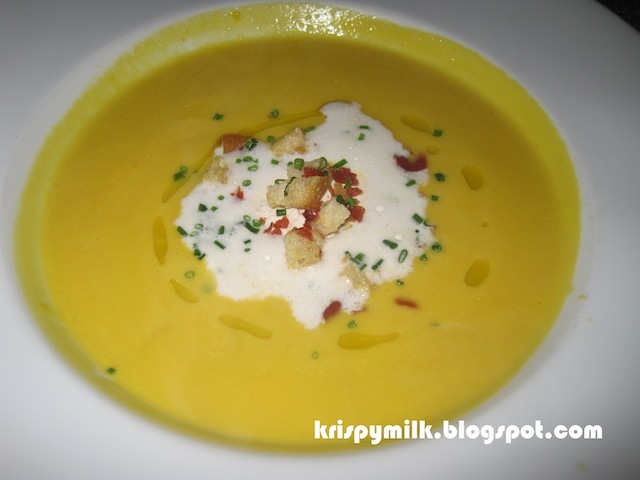 The presentation was really nice, and the soup was rich and creamy. 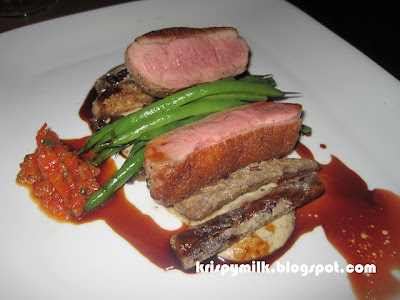 The duck breast ($26) was really tender, and I especially loved the eggplant "frites". They were a much better alternative to regular fries. I got the appetizer size saffron shellfish risotto ($11). It was really savoury but not too salty. I wasn't planning on dessert, but I was tempted by the Callebaut chocolate pot de creme ($7.50). It was served with Maldon sea salt, cocoa nibs, creme chantilly, a double chocolate sable cookie, and a gooseberry. I guess gooseberries are not in season, so it didn't taste that great. 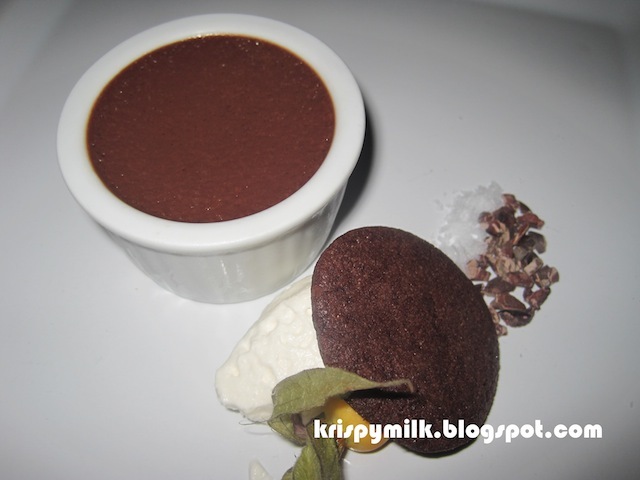 The sea salt and cocoa nibs didn't taste very special by themselves, but they were SO GOOD with the pot de creme! They really brought out the flavour of the chocolate. In comparison, the chocolate cookie was just average. But I'm sure that if I ate it before I ate the pot de creme, I would have found it delicious as well. I was very happy with the meal and found the food quite impressive. Despite the slow service, the evening was enjoyable and I look forward to dining here again.